On April 27, several satellites including NASA's Swift satellite and Fermi Gamma-ray Space Telescope observed an unusually bright burst of gamma radiation. The explosion unleashed an energetic jet of particles that traveled at nearly the speed of light, researchers said. "We suddenly saw a gamma-ray burst that was extremely bright a monster gamma-ray burst," study co-author Daniele Malesani, an astrophysicist at the Niels Bohr Institute at the University of Copenhagen in Denmark, said in a statement. "This [was] one of the most powerful gamma-ray bursts we have ever observed with the Swift satellite." The gamma-ray burst was described in a series of studies published online Thursday in the journal Science. Gamma-ray bursts, or GRBs, are the most powerful type of explosions in the universe and typically mark the destruction of a massive star. 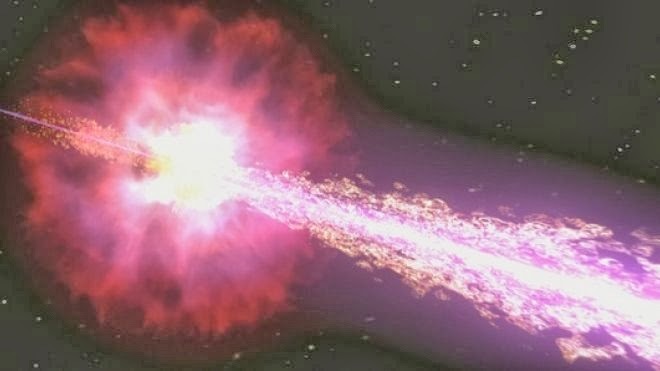 The original stars are too faint to be seen, but the supernova explosions that signal a star's death throes can cause violent bursts of gamma radiation, researchers said. Gamma-ray bursts are usually short but extremely bright. Still, ground-based telescopes have a tough time observing them because Earth's atmosphere absorbs the gamma radiation. The extremely bright gamma-ray burst seen earlier this year, officially dubbed GRB 130472A, occurred in a galaxy 3.6 billion light-years away from Earth, which, though still far away, is less than half the distance at which gamma-ray bursts have previously been seen. This closer proximity to Earth enabled astronomers to confirm for the first time that one object can simultaneously create a powerful GRB and a supernova explosion. "We normally detect GRBs at great distance, meaning they usually appear quite faint," study co-author Paul O'Brien, an astronomer at the University of Leicester in the United Kingdom, said in a statement. "In this case, the burst happened only a quarter of the way across the universe meaning it was very bright. 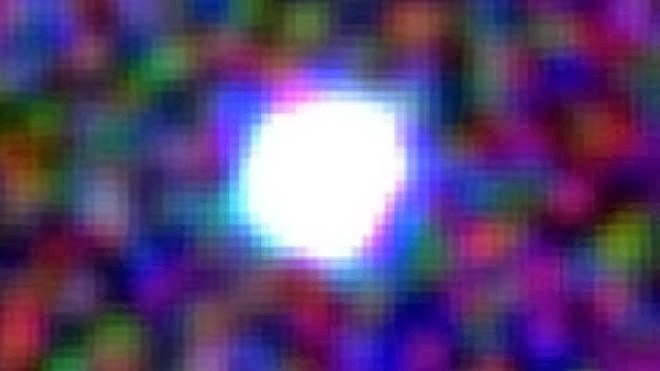 On this occasion, a powerful supernova was also produced something we have not recorded before alongside a powerful GRB and we will now be seeking to understand this occurrence." The jet produced by the gamma-ray burst was formed when a massive star collapsed on itself and created a black hole at its center. This generated a blast wave that caused the stellar remnants to expand, producing a glowing shell of debris that was observed as an extremely bright supernova explosion. After analyzing properties of the light produced by the gamma-ray burst, scientists determined that the original star was only three to four times the size of the sun, but was 20 to 30 times more massive. 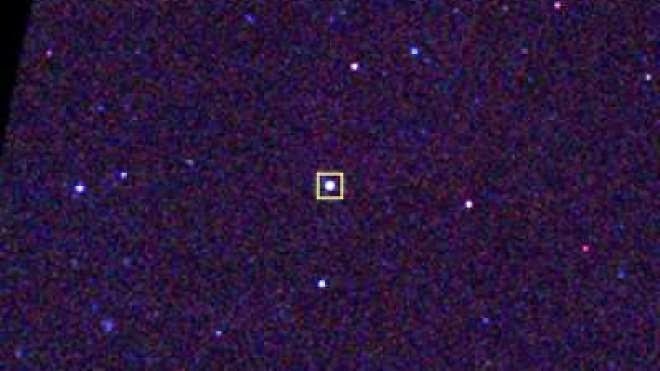 This extremely compact star was also rapidly rotating, the researchers said. The GRB was the brightest and most energetic ever witnessed and triggered dynamic internal and external shock waves that are still not well understood. Though scientists have a clearer view of the violent explosion, mysteries remain. For instance, space telescopes detected more photons and more high-energy gamma-rays than theoretical models predicted for a gamma-ray burst of this magnitude. Researchers are still investigating why the energy levels seen with GRB 130472A do not quite match predictions from existing models of gamma-ray bursts. Their results could lead to more refined theories about how particles are accelerated, which could help astronomers better predict the behavior of cosmic events. "The really cool thing about this GRB is that because the exploding matter was traveling at [nearly] the speed of light, we were able to observe relativistic shocks," study co-author Giacomo Vianello, a postdoctoral scholar at Stanford University in California, said in a statement. "We cannot make a relativistic shock in the lab, so we really don't know what happens in it, and this is one of the main unknown assumptions in the model. These observations challenge the models and can lead us to a better understanding of physics."